A student apparently took just minutes to adjust to his new bionic hand after it was fitted. The 19-year-old is the second person in Britain to be fitted with an i-Limb. Evan Reynolds, a keen sportsman studying sports biology at the University of the West of England (UWE), lost his left hand in a car accident in 2006. The teenager was resting his left hand on the window ledge when the car scraped a post as it exited a car park. Reynolds lost his hand instantly. He was a passenger in the car at the time. 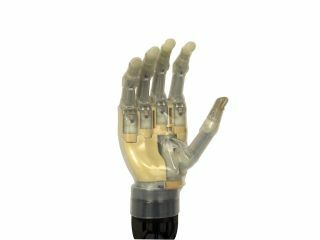 Reynolds' older brother saw a TV report about i-Limb and contacted Touch Bionics – the company that came up with the award-winning device – to arrange for his sibling to be fitted with the prosthetic hand. The i-Limb is revolutionary because reacts to myoelectrics: the signals sent to the remaining limb from the brain. "I put it on and within minutes I was using it as well as I can today," Mr Reynolds told the Press Association. "People always ask how it's changed my life, but there's no specific thing. It's the hundreds of everyday things you take for granted, which I can do again - like peeling a potato, catching a ball, holding a bottle of water, " he said.